In this post, we’ll take you through the main components of checking item availability. The availability calendar is shown below. It shows the status of all the items in the system so you can plan out asset utilization accordingly. You can also group and filter this data in different ways to make the most out of availability information. We’ll describe this in the sections that follow. First, choose whether you’d like to check the availability of assets or asset stock by choosing between the radio buttons below. Here, you can choose to group items by Name, Product Model Number, or Group, depending on how you’ve set up your items and what would be easiest to sift through. You can choose a category and have the system bring up a specific element by typing in the name in the field below. For example, the configuration below will show you the availability of all items from the group ‘IT Equipment’. If you don’t choose a specific element, you’ll be shown all items from the category chosen. Below, availability is shown for all the Groups we’ve set up in EZRentOut. You can also sift through present or future months, as shown below. This is a quick way to bring up an item’s status further down the road. Set the calendar to show daily or hourly views, depending on what you’re looking for. You can check availability for all items, or those belonging to specific Locations or Groups. Here, we’ve chosen to show items from one main location, and have also checked the option to see items from all its child locations. Now that you’ve set up which items you want to see the availability of, you can scroll down and see the items’ status. You’ll get a few different data points. Total Items: The total number of a specific item you have on file. Overdue Items: All items that are due for return. Available Items: Items available to be rented out. Checked Out Items: The number of items that have been rented out. Reserved Items: These are items that have been reserved for that period. Items Under Maintenance: Items that are being serviced. You can also add items to an order directly from this page by clicking the cart icon highlighted below. Clicking the cart icon opens up an overlay where you’re asked how many of that item you wish to add to an order. If you don’t mind adding unavailable assets to the order, leave the checkbox below blank. On the other hand, if you only want to add available items to the order, click the checkbox. Now, you can choose the dates during which the items should be available. For items available currently, leave the date fields blank. Note: Overdue items are treated as ‘Available’ by the system. This means you will be able to add them to an order if you’ve checked the option for available assets, even though they are yet to be returned. With these steps, you should be able to look up item availability for smooth rentals and reservations with both speed and ease. – When you click on the ‘Check Availability’ icon, it shows the details of an Item’s availability. 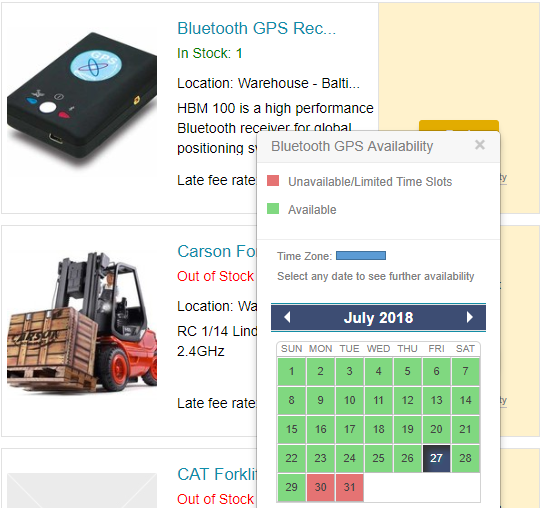 The red dates show that the item is not available or has limited time slots and the green dates show the availability of the item. Limited time slots refer to the rent out time you set on rental periods. This entry was posted in [Support] and tagged availability calendar by admin. Bookmark the permalink.